Some of his disciples were remarking about how the temple was adorned with beautiful stones and with gifts dedicated to God. But Jesus said,  "As for what you see here, the time will come when not one stone will be left on another; every one of them will be thrown down." He replied: "Watch out that you are not deceived. For many will come in my name, claiming, 'I am he,' and, 'The time is near.' Do not follow them. When you hear of wars and revolutions, do not be frightened. These things must happen first, but the end will not come right away." Then he said to them: "Nation will rise against nation, and kingdom against kingdom. There will be great earthquakes, famines and pestilences in various places, and fearful events and great signs from heaven. "But before all this, they will lay hands on you and persecute you. They will deliver you to synagogues and prisons, and you will be brought before kings and governors, and all on account of my name. This will result in your being witnesses to them. But make up your mind not to worry beforehand how you will defend yourselves. For I will give you words and wisdom that none of your adversaries will be able to resist or contradict. You will be betrayed even by parents, brothers, relatives and friends, and they will put some of you to death. All men will hate you because of me. But not a hair of your head will perish. By standing firm you will gain life. Destruction of the Temple (21:5-6). Lesson 91. Deceptive Signs of the End (21:7-11). Lesson 91. Persecution of the Disciples (21:12-19). Lesson 91. Judgment upon Jerusalem (21:20-24). Lesson 92. Coming of the Son of Man (21:25-28). Lesson 92. Certainty of the End Events (21:29-33). Lesson 93. Be Watchful and Ready (21:34-36). Lesson 93. Rather than trying to synthesize all the teaching in the Bible about End Times, I'll be focusing on the teaching that is contained in Luke's Gospel, assuming, as I do, that it comes from the words of Jesus. Let's begin -- prayerfully. "Lord Jesus, we admit that we don't understand all of this that we are studying, but please open up our hearts to understand your heart. Help us to grasp very firmly the lessons you have for us. In your name, we pray. Amen. Herod's Temple was an architectural marvel that had been under construction for the entire lives of the disciples who now stood within it, listening to Jesus' teaching. Here are a couple of photos from a large model at the Holyland Hotel in Jerusalem that give you an idea of what it looked like. 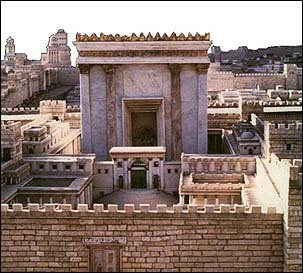 The temple was many, many times larger than any building in Galilee. It was immense and glorious, a tremendous symbol of national pride. These "country bumpkins" from Galilee could not help but be impressed. The words "thrown down" translate the Greek verb kataluo. It can mean literally "to detach in a demolition process, thrown down, detach" as in this passage. But it is more commonly used in the New Testament to mean more generally "destroy, demolish, dismantle" and "put an end to." The amazing stones were indeed turned into rubble by the Romans in 70 AD. 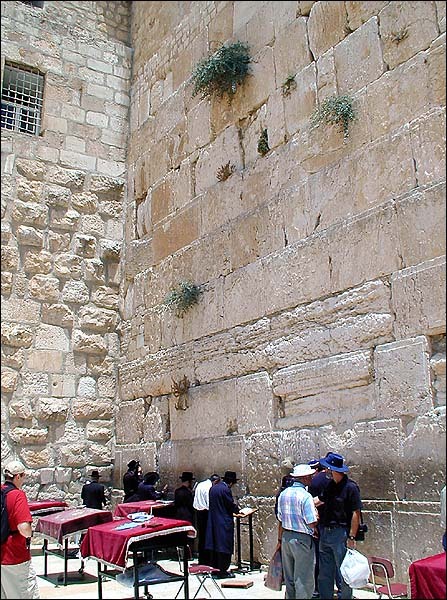 All that remains of the temple now is a portion of a retaining wall, called the western wall or the wailing wall that is the most holy prayer spot for present-day Jews. Notice the disciples' two questions: (1) When will it happen? and (2) What sign will precede this event? Jesus will answer these questions, after a fashion, in the next few paragraphs. The word translated "sign" in this verse and other verses in this chapter is Greek semeion, "a sign or distinguishing mark whereby something is known, sign, token or indication." It can also mean "an event that is an indication or confirmation of intervention by transcendent powers, miracle, portent." In this section that we've titled Deceptive Signs of the End (21:7-11), Jesus outlines a number of coming events are NOT immediate signs of the end. We are not to run after this person or that who is acclaimed as the messiah -- even if they can do miracles. We had a few of these in the Twentieth Century -- Father Divine, Sung Myung Moon, David Koresh, and others. We'll have more in the Twenty-First Century. Historically, it seems that every generation has had their claimants to being the Messiah. Leon Morris says about this verse: "Jesus was not predicting the end of the world within the lifetime of men then living. He regarded those who make such forecasts as false prophets." "Revolutions" (NIV) or "commotions" (KJV) translate Greek akatastasia, which can refer to an "unsettled state of affairs, disturbance, tumult" as well as "opposition to established authority, disorder, unruliness, insurrections." When political and military upheavals convulse a nation, it is tempting to see it as a sign of Jesus' coming. Notice, Jesus says clearly, "The end will not come right away." He predicts even more wars, earthquakes, famines, and disease epidemics. The word "pestilences" is Greek loimos, "pestilence, plagues, diseases." Then he speaks of great signs from heaven -- conjunctions of planets, comets, meteors, eclipses, etc. Not even these are signs of his coming, though some will see them as such. During the Middle Ages the Black Death (bubonic plague) decimated one-third of Europe's population. 25 million people died in just under five years between 1347 and 1352. Successive waves of the Black Death followed in the next couple of centuries. 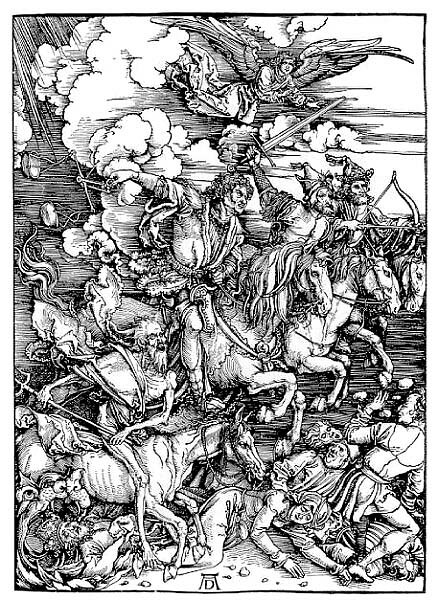 People of the time interpreted this as the Fourth Horseman of the Apocalypse -- Death -- who would kill one fourth of mankind by disease (Revelation 6:7-8). No wonder this was a time of expectation that Christ would soon return! Now we move to the third section of Jesus' teachings here: Persecution of the Disciples (21:12-19). Even though Jesus hasn't returned yet, we can expect persecution. The word "persecute" is Greek dioko, "to harass someone, especially. because of beliefs, persecute." The root idea of the verb is "hasten, run, press on," so that "persecute" may carry the idea of chasing someone. "Synagogues" were places of local judgment by Jewish leaders. "Kings and governors" indicate that the disciples would also be judged before Gentile tribunals. But see the purpose in this. "This will result in your being witnesses to them" (21:13). The words "result in" (NIV) or "turn to" (KJV) are a figurative sense of the Greek verb apobaino, "to result in a state or condition, turn out, lead (to)." The words "witnesses" (NIV) or "testimony" (KJV) translate Greek marturion (from which we get our English word "martyr"). It means "that which serves as testimony or proof," which could be an action or circumstance, or a statement. When our world seems to be falling apart, we are to look to God. He purposes that in all the turmoil we will be witnesses to him. Most of the time people just display their outer faces to one another. But in times of extreme distress the masks come off and the real person emerges. When that happens to Christians, people are to see our faith in Jesus clearly displayed. If it is a sham, that will be revealed. But if it is real, then we become powerful witnesses to him, even in our distress. Jesus warns his disciples not to spend hours in their prison cells preparing eloquent speeches so they can recite them, word perfect, to their judges. The phrases "worry beforehand" (NIV) or "meditate before" (KJV) translate Greek promeletao, "to prepare beforehand by giving careful thought an attention, practice beforehand, prepare." The word translated "defend" (NIV) or "answer" (KJV) is Greek apologeomai (from which we get our English word "apologize"). But in Greek the word doesn't indicate making excuses, but "to speak in one's own defense against charges presumed to be false, defend oneself." And there's a wonderful promise, that our testimony in such circumstances will come with such power that our opponents' false testimony won't be adequate to convince otherwise. The word "resist" is Greek anthistemi, "be in opposition to, set oneself against, oppose." The words translated "contradict" (NIV) or "gainsay" (KJV) is Greek anteipon, "to say something in reply, say in return, contradict." Oh, they may condemn and execute us, but the testimony of Jesus will haunt them because of the Spirit-inspired words that echo in their ears. When you consider the history of the Christian church, the death of martyrs has sometimes been more powerful than their lives. Killing Christians only serves to convince people of Christianity's truth. Tertullian said it well: "The blood of martyrs is the seed of the church." It is interesting that Luke, who places such an emphasis on the Holy Spirit's work, quotes Jesus as saying "I will give you a mouth and wisdom," whereas the other Synoptic Gospels attribute this to the Spirit (Matthew 24:20; Mark 13:11). Of course, it is the Spirit of Jesus speaking, so it means the same thing. Dear friends, unfortunately, Jesus isn't telling us that we don't need to prepare Sunday school lessons or sermons, that the Spirit will speak instead of us. This applies to testimony during persecution, not everyday ministry. Yes, the Spirit can anoint our poor efforts in a wonderful way. But he can usually anoint and use our prepared presentations even better. Pastor, teacher -- unless you are planning to be martyred on Sunday morning -- prepare! The word translated "betrayed" is Greek paradidomi, "hand over," in this case "hand over, turn over, give up a person, as a technical term of police and courts, 'hand over into the custody of.' " The word does not mean "betray" in itself. It is neutral of moral implications of disloyalty. But when it is put in the context of being "turned in" by family and friends, then it carries the meaning of betrayal by those who should have been loyal. The phrase "put to death" is Greek thanatoo, "to cause cessation of life, put to death, kill someone, hand someone over to be killed, especially of the death sentence and its execution." When our relatives reject us it hurts. But there is some comfort in the fact that Jesus' contemporaries rejected him, too. They didn't want to hear his truth, however lovingly expressed. "All men will hate you because of me," he says (21:17) It is because of Jesus, it is on Jesus' behalf, that we must sometimes bear this kind of painful rejection. Jesus says we'll be persecuted, condemned, and put to death, and not even a single strand of our hair will be destroyed? How can this be? Jesus shifts here from the physical realm to the spiritual. Even though we may die physically, spiritually we are whole. Spiritually we are okay. Spiritually, we may die a martyr's death, but we enter into his presence in great glory. Spiritually we are saved, rescued, redeemed, with Christ. Let's look very carefully at Jesus' words for a moment. The word "not" in verse 18 is not just a simple negative, but in Greek it is a double negative. In English, a double negative becomes a positive. But in Greek, the opposite happens. A double negative is a doubly reinforced negative. The Greek words ou me we might translate emphatically as "by no means" or "never, certainly not." The lexicon calls it a "marker of reinforced negation" that has the effect of strengthening the negation. The word "perish" is Greek apollumi, "to cause or experience destruction, in the passive voice, "perish, be ruined." In other words, Jesus says this with all seriousness and emphasis, as the Psalmist of old: "In God I trust; I will not be afraid. What can man do to me?" (Psalm 56:11). We will NOT by any means perish, no matter what man does to us. The phrase "standing firm" (NIV) or "patience" (KJV) is Greek hupomone, "the capacity to hold out or bear up in the face of difficulty, patience, endurance, fortitude, steadfastness, perseverance." We will need to stand firm. But we have a wonderful promise before us: "You will gain life." The word "gain" (NIV) or "possess" (KJV) is Greek ktaomai, "to gain possession of, procure for oneself, acquire, get." Here it could be translated, "You will win your lives by your endurance." The word translated "life" (NIV) or "soul" (KJV) is Greek psuche (from which we get our English word "psychology"). It is a difficult word to translate exactly. Greek thought is dualistic, separating body from soul. The word translates the Hebrew word nephesh, which comes from the root meaning "to respire, to breathe." But nephesh is more than the breath of life; it is the usual term for a man's total nature. Does this mean that we are saved by our own endurance. No. We are saved by grace through faith. But faith, true faith, persists, perseveres against all odds. The last days leading up to the Coming of Christ will be difficult. They will be perilous. It is said that in the Twentieth Century more Christians died for their faith in these 100 years than all the centuries back to Christ put together. God only knows what the Twenty-First Century holds. But if we know without a shadow of doubt that men's threats cannot harm us spiritually, we can stand. Our faith strengthens us. His strength becomes our strength. If we know that "For me to live is Christ, and to die is gain" (Philippians 1:21), then we can stand. If we trust Christ's promises, we can stand in the face of anything. Father, we live in perilous times. Help us not to be weak and fearful when we are tested and persecuted for your sake. Instead, let us be bold in our Lord. Give us peace. Give us faith. Give us strength that we might bring glory and honor to you. Lord, for those Christians who right now are facing suffering, persecution, and death for your name, let this be their finest hour. Strengthen them by your Holy Spirit's power to continue in their faith. In Jesus' name, we pray. Amen. 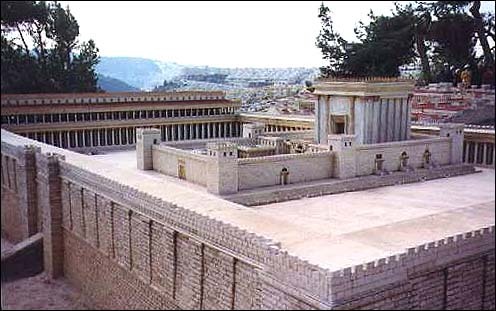 What does Jesus say will happen to Herod's Temple? (21:5-6) When did this take place? What kinds of signs will be seen that do NOT portend the immediate return of Jesus? (21:7-19) Why are people tempted to see them as signs of the end? What good results from a disciple's persecution and death, according to verse 13? If Christians will be condemned and executed, what does it mean, "Not a hair of your head will perish"? What does Jesus mean by this? What does the phrase mean, "By standing firm you will gain life." (21:19) Is this "faith by works" or something else? Topics according to Marshall, pp. 752-784. Leon Morris, The Gospel According to St. Luke (Tyndale NT Commentaries: Eerdmans, 1974), p. 296. BDAG 646, meaning 4. Blass, Debrunner, and Funk, A Greek Grammar of the New Testament (University of Chicago Press, 1961), p. 184, sec. 365. BDAG 1098-1100. Edmond Jacob, Albert Dihle, Eduard Lohse and Eduard Schweizer, "psuche, ktl." TDNT 9:608-660.